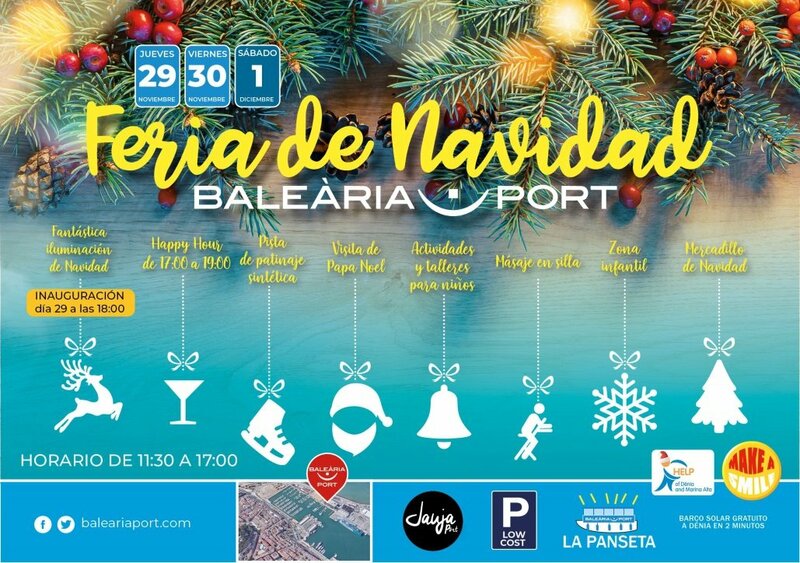 Baleària Port to host Christmas and international charity fair in Denia. On Thursday 29th November and the morning of Friday 30th November there will be an exhibition of high end, luxury cars provided by Design Cars of Jávea. On the afternoon of Friday 30th November and the morning of Saturday 1st December Retromania VW Club will be exhibiting a selection of classic Volkswagen cars and vans. Visitors to these events will make a charitable donation of €1 per person, which will be distributed between the four charities: Make A Smile, Help Dénia, AMADEM and Aprodeco. The Christmas Fair will be held in the Juaja event venue on the top floor of Baleária Port on Thursday 29th November, Friday 30th November and Saturday 1st December from 11.30am to 5.00pm. There will be a total of 36 stalls selling artisan products and original Christmas gifts. During the Fair, fundraising events will be held for the three event charities. There will also be a choir singing Christmas carols and, amongst several activities for children, Santa Claus will be in the Fair on Saturday. Baleària Port comes alive every Christmas with lights and decorations that convey the Christmas spirit. This year, the lights will be officially turned on at 6.00pm on Thursday 29th November. For the first time, Balearia will have its own Nativity scene on display throughout the Christmas season. This impressive Nativity scene has been designed and installed by Emilio Martínez Mestre who has been creating Nativity scenes for over 40 years. The Nativity scene will be unveiled on Thursday 29th November at 6.30pm. Access to the International Fair will be through the Baleària Port main entrance. The International Fair will be officially opened by a surprise celebrity! International Fair on Thursday, 29th November, Friday 30th November and Saturday 1st December. The Fair will be held in the main hall of Balearia Port. 14 countries will be represented and each will host a stand to promote the culture, gastronomy, drink, fashions and music of their country. De Schuimkoppen is a traditional 40-strong men Dutch choir based in Denia which sings shanties and other songs in Dutch, German, English and Spanish. They will be performing at the International Fair on Thursday 29th November at 8.30pm. Spirit of Saint Louis Dénia Lindy Hop is a project started in 2014 by members of the Circolio association with the support of the Spirit of Saint Louis organization Valencia. Lindy hop, with the aim of promoting the culture of lindy hop dance and the swing music in the Valencian Community. They will be performing at the International Fair on Friday 30th November at 8.30pm to 10:30pm.